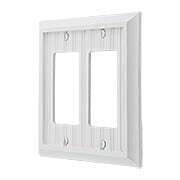 Featuring rows of narrow wood planks, our Cottage White Wood switch plates are inspired by classic bead board. 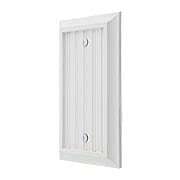 They are ideal for a Colonial-Revival, farmhouse or beach cottage home. 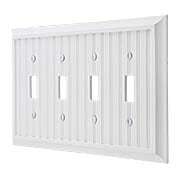 These traditional-style switch plates and outlet covers are available in a variety of configurations from toggle to GFI. 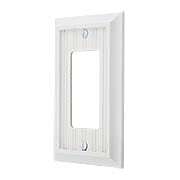 Whether your style is traditional, Colonial-Revival, or cottage, our White Wood Single-Toggle Switch Plate is a fitting choice. Inspired by classic bead board, this simple design features rows of narrow wood planks separated by small indentations. Highly versatile, it brings a bright, clean look to any room. A metal plate at the back side provides added safety and stability. Whether your style is traditional, Colonial-Revival, or cottage, our White Wood Single-Blank Cover Plate is a fitting choice. Inspired by classic bead board, this simple design features rows of narrow wood planks separated by small indentations. Highly versatile, it brings a bright, clean look to any room. A metal plate at the back side provides added safety and stability. 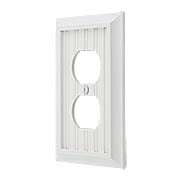 Whether your style is traditional, Colonial-Revival, or cottage, our White Wood Double-Toggle Switch Plate is a fitting choice. Inspired by classic bead board, this simple design features rows of narrow wood planks separated by small indentations. Highly versatile, it brings a bright, clean look to any room. A metal plate at the back side provides added safety and stability. 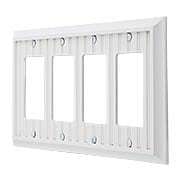 Whether your style is traditional, Colonial-Revival, or cottage, our White Wood Double-Gang Duplex Cover Plate is a fitting choice. Inspired by classic bead board, this simple design features rows of narrow wood planks separated by small indentations. Highly versatile, it brings a bright, clean look to any room. A metal plate at the back side provides added safety and stability. 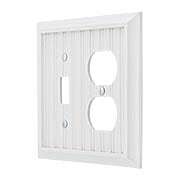 Whether your style is traditional, Colonial-Revival, or cottage, our White Wood Double-GFI Switch Plate is a fitting choice. Inspired by classic bead board, this simple design features rows of narrow wood planks separated by small indentations. Highly versatile, it brings a bright, clean look to any room. A metal plate at the back side provides added safety and stability. 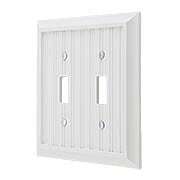 Whether your style is traditional, Colonial-Revival, or cottage, our White-Wood Toggle and GFI Combination Switch Plate is a fitting choice. Inspired by classic bead board, this simple design features rows of narrow wood planks separated by small indentations. Highly versatile, it brings a bright, clean look to any room. A metal plate at the back side provides added safety and stability. 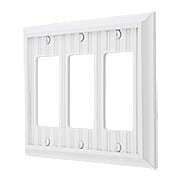 Whether your style is traditional, Colonial-Revival, or cottage, our White Wood Triple-Toggle Switch Plate is a fitting choice. Inspired by classic bead board, this simple design features rows of narrow wood planks separated by small indentations. Highly versatile, it brings a bright, clean look to any room. A metal plate at the back side provides added safety and stability. 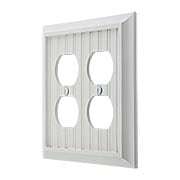 Whether your style is traditional, Colonial-Revival, or cottage, our White Wood Triple-GFI Switch Plate is a fitting choice. Inspired by classic bead board, this simple design features rows of narrow wood planks separated by small indentations. Highly versatile, it brings a bright, clean look to any room. A metal plate at the back side provides added safety and stability. 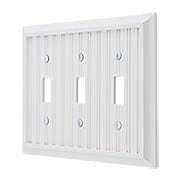 Whether your style is traditional, Colonial-Revival, or cottage, our White Wood Quad-Toggle Switch Plate is a fitting choice. Inspired by classic bead board, this simple design features rows of narrow wood planks separated by small indentations. Highly versatile, it brings a bright, clean look to any room. A metal plate at the back side provides added safety and stability. 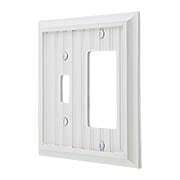 Whether your style is traditional, Colonial-Revival, or cottage, our White Wood Quad-GFI Switch Plate is a fitting choice. Inspired by classic bead board, this simple design features rows of narrow wood planks separated by small indentations. Highly versatile, it brings a bright, clean look to any room. A metal plate at the back side provides added safety and stability.